Poppies and Ice-cream: Attachment parenting, us? Parenting can be very confusing. You think you are going to do things in a certain way and you end up surprised at the choices that end up being best for your family or particular child. I try hard not to subscribe to any parenting philosophy. I like to have my own opinions, discuss and parent according to our own mish-mash, that we make up as we go. And I reserve the right to change my mind as well. People can get very radical (they don't call the phenomenon "mommy wars" for nothing). But there are no black-and-white solutions, no "right" way to do things and every kid is different. What works for one child, does not work for another. We are all trying to do the same, raise happy, healthy, children. (Anna, said it best*). Yet, I found myself shocked at our 'attachment parenting' tendencies. When I first heard about the movement, I cringed. Hippy, dirty-looking parents (because soap is bad), hanging out in a field of flowers with their 7-year-old kids that are still breastfeeding and don't study math because they hate it; the kind of people who will only eat fruit once and if it has fallen off a tree and don't believe in discipline or limits because it could harm the fragile feelings of their offspring**. To each its own, but I did not see myself like that. And I swore I was going to raise independent children. Then I watched that documentary, Rauw*** (Raw) about a mother who imposes her diet to her son, and continuously tells him "the others are wrong, one day they will realize", where perhaps, the most telling moment of the whole film is when the kid tells her mom something along the lines of "everyone can make their own choices and they should be honoured and respected". 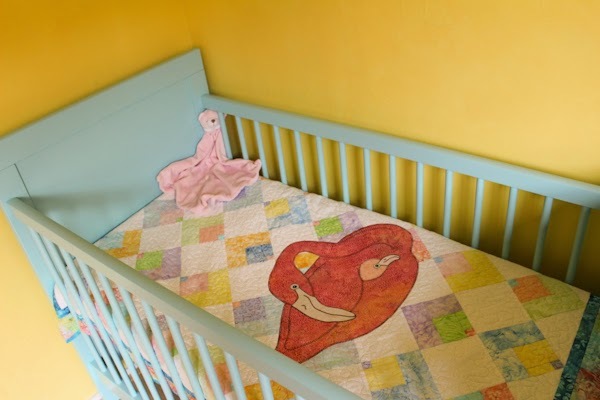 I always thought our daughter was going to sleep in her own crib from day one. I thought it was just a matter of putting her there, oh naive me. Then she was born too early and we wanted to have her close to us, so she slept in her Moses basket, by our bed. And she slept fairly well. When she was 5 and 6 months she started sleeping through the night, mostly (well, from 11 pm to 6 am without any feedings or wake ups in between). At about the same time we went to Mexico for a month, where she continued to sleep (on one of those giant American-style cribs); but when we came back she had grown so much she did not fit in her Moses basket anymore, so we decided it was a good time to transfer her to her own crib, in her own room. At the beginning it went well, for a few nights. But then, she started to wake up every 3 hours, then every 2 hours. At one point she was waking up e-v-e-r-y s-i-n-g-l-e h-o-u-r. This happened gradually, the lowest point happened sometime around November, when after trying everything from sleeping on a mattress by her side, to rocking her, stuffing her with heavy food (like potato) and milk, we went to see a baby sleep coach. You can imagine how tired we were, from bringing her back and forth to her crib, soothing her, only to have her wake up, again, and again, and again. We read, and read, and read. We concluded this probably had to do with separation anxiety and maybe teething, which took a long time for her and started around that time. In the end, in a moment of desperation, Mark took the baby and put her in our bed. I started crying, left the room in desperation and told him that if we did this now, there was no going back. I was also still very scared of SIDS and did not want her to choke under a blanket, pillow, or be crushed by us like a tiny piglet by its mom. But we really had tried everything and we were both so exhausted we could not continue functioning as it was. She started sleeping better, waking up less. I started enjoying it. I read some more, realized that maybe it was OK if she still needed the security of being close to us, that she would become independent at her own pace and time. Co-sleepers are extremely expensive so we ended up doing the famous IKEA hack... which is quite simple really: just the cheapest crib, without one of the fences which is then attached to the bed with rope. We hope and assume that when she is mature enough for the change she will let us know herself. (Or we will reassess in the future). In the meantime she knows her room and crib very well, as she sleeps her day time naps there without any problems. Did you end up doing things way differently than you ever imagined you would? "Yes, I worry, as any overly informed middle-class mother would, about their sleep, their appetite, the number of wet diapers, my breast milk supply, whether I’m giving them equal amounts of time and attention, whether we’ll crack the impossible equation that is childcare. Quite frankly, though, those concerns feel superficial. Below all this is a thick, solid layer of serenity. We’re ok. The kids are all right. We’re drilling down to the bare essentials: food, sleep, love, laughter. My daughters are healthy, happy children. My husband is an incredible, bright, loving father. Bath time is a party, playtime is hilarious, nap time is my fun time, their morning smiles are rays of sunshine." ** That is a caricature I invented in my mind, probably based on some documentary I watched sometime. I do not mean to be judgemental, I am just trying to illustrate a point. *** The documentary (Rauw) is in Dutch, but you can watch it here. I always swore that never would I cosleep with any baby of mine as well. But hey you do what works and now it's one of my favorite things ever. Surprisingly I worry less about risks because she's right there and I can always check on her. I also sleep crazy still when she's with me which helps. Yeah, right there with you. But yes, I find it now so sweet. And you really do what is best for you and for the baby. Maybe with other kids it will be different. And yeah , checking all the time. I was going to breast feed, until at about 37/38 weeks I decided that I really didn't want to. I formula feed and have faced a fair bit of judgement because of it, but I am very comfortable with my decision so their judgements, rude comments, sad looks, don't really get to me. the parent-child dynamic is fluid, not structured (even if you parent in a structured way) so you have to open to what works for both parties. We don't co-sleep because I really dislike it, I can't sleep, he doesn't sleep so well and the whole thing turns into a disaster. Instead, he is very independent when it comes to sleep - sleeps in his own room, has only ever slept in his own crib (except when ill) My role is to constantly think about his needs though, so when he had horrible jet lag and was all confused, he cuddled in with me, and when he had a horrible flu virus he stayed with me for 2 weeks. And I guess that's what you say about adapting and changing. It's my job to keep him as comfortable as possible whilst being happy with the decisions we make. Yeah, fluid is the best description. I heard about babies being born independent (regarding sleeping and space) and I think it is that way, also regarding patterns (we are all different, I am a really good sleeper, can sleep in a noisy, moving environment if I am tired, Mark just can't sleep), so I guess we are what we are and like you say our role is to better take care of their needs. And defend your choices, or just shrug off the nonsense. Hahaha oh yes I could have literally written this post. I'm a child psychologist for gods sake. I believe in scientific, behavioral principles! And yet I co-sleep and I'm still nursing at 16 months!! You have to do what works for you, your baby, and your sanity. For me, right now, it's Baby starts in his own room but ends up in ours halfway through the night. This is the only wake up of the night and there is no night nursing allowed. It's my happy medium. Yeah, you do what works. Yu also starts in her own room, but later comes to us. We are working on night weaning but it is hard. Though the last two nights she has gone for 6 - 7 hrs stretches without nursing, so I am calling that a big progress. Hope it stays. Write about weaning ... I would love to hear your advice. The journey of being a mom is such an adventure. You never imagine all the things you will face even you read and read. All my pregnancy I used to read so much, about the pregnancy itself but also about how to raise baby etc.. and this moment sometimes I wonder if I read enough or if I read a lot. Since the beginning I decided to do the co-sleeping. I found it nice and also practical. I never wanted the baby to sleep with us, because in my head the bed is for mama and papa that is why i decided to get a cosleeper so everyone has their own space. For me, I would like to keep M with us up to 1 year, but if she needs more time, then I will. Yes, co sleepers are the best middle solution. I am really liking it. I think babies let you know what they need. A friend of mine told me at some point her kid / toddler told her he was now ready to go to his room, that he was not a baby and that he was leaving their room. So it does happen. I also think making the change smooth for the baby is possible.